Below you will find documents and information to support you in learning more about SSHA, our advising office, and registering for courses. Learn more about academic planning, discovering your strengths, and how to apply yourself while at UC Merced. Extensive list of frequently used links and websites for SSHA students. Put together by the office of Center for Career and Professional Advancement (CCPA), "Pathways to Students Success" offers a four year career planning route. Interested in studying abroad? As a SSHA student it is definitely possible! Visit the Office of International Affairs in KL 101. For questions regarding your suggested schedule please email (using your UC Merced email) your major advisor (include your full name, student ID, and declared/intended major). If you do not know who your advisor is find out here. Degree Attainment for Returning and Transfer Scholars (DARTS) - The DARTS program is a supportive community designed for returning and transfer students. The program offers career development services, tutoring and workshops according to student needs. If you are interested in taking a course but have not completed the prerequisite(s), you will need permission from the instructor to enroll in the course. 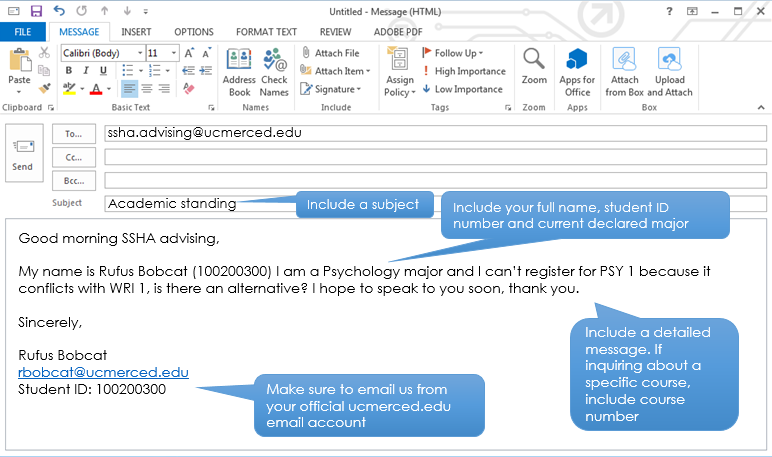 Email the instructor of the course and request permission to enroll without the prerequisite; if the instructor allows you into the course forward their approval email to your academic advisor, and include your full name, student ID, current declared major, and course name and number (ex. ECON 100). Please be aware that if the course is closed, you will need to continue to check the schedule of classes and look for open seats. If the instructor is not listed under the course you will need to wait until the beginning of the semester and get written permission from the instructor by having them fill out a Requisite Override Enrollment form and turning it in to the Students First Center before the add deadline. With careful planning, preparing for health professions can be done in majors outside of the sciences. The links below will guide you on resources, events, newsletters/listervs, and scheduling an appointment to meet with a Pre-Health Advisor.